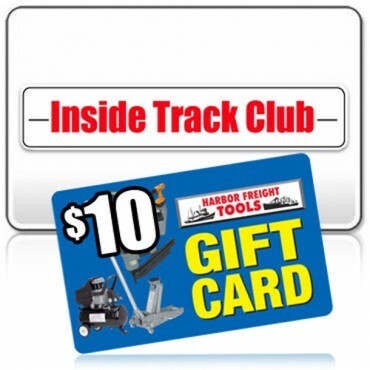 I stopped at my local Harbor Freight store and learned that for “the rest of the month” you can get a $10 gift card when you join their Inside Track Club, which costs $29.99. The deal is available both online and in their stores. You may want to tell your store cashier that you want to join and get the gift card because you may not get it automatically. At least that was the case in my the store. They had to void my purchase and ring it up a different way so they could give me the card. There won’t be any confusion if you buy it online and it looks like they’ll ship it for free if that’s the only item you buy. I’ve been wondering for a long time if the Inside Track Club is worth $30 a year. I guess I’m going to finally find out and so will you, because I’ll let you know. There was a time when I was spending so much money at Harbor Freight that I’m sure it would have more than paid for itself. But my shop is so well equipped (and I also have so little space) that I don’t buy as much now and I only stopped in yesterday because I was nearby. I just bought a two yr membership today and there was no mention of the $10 gift card. I found out when I went online after it was too late. That sux. I purchased a membership today and did not get a $10 gift card. I only found out about it online. Be happy while you’re living, for you’re a long time dead.